Homage to BCN is going to be joining in with the Instagram challenge below. I hope to see some other Barcelona Instagrammers joining in too! Every day for one week, we challenge you to repost photos from your favourite Instagram profiles that you follow in Barcelona, using the same hashtag #IGShoutOutBarcelona and #SMDay — June 30th is Mashable’s Social Media Day around the world. Select photos to repost from Barcelona themed or based profiles onto your Instagram profile. We ask that you repost photos from at least 10 different profiles per day from June 27th-July 1st. Hint: This works best to increase engagement if you repost photos from Instagram profiles with similar themes as yours and with a similar range of followers. Check out this photo from one of my favourite Barcelona profiles @username during #IGShoutOutBarcelona week for #SMDay. (Next, you can put a personalised message saying why – for example…) They have an interesting profile that I have been following. I think you will enjoy their photos and content as much as I do. Thanks! Hint: You can use the Repost app: repostapp.com/ig. In the comment area, we post all other hashtags – important: do not put the hashtags in the caption, except #IGShoutOutBarcelona and #SMDay. Keep the caption area clean and focused on the username. As well, for search optimisation, hashtags in the comment section still function the same as if they were in the caption. After 2-3 hours, you can remove the pictures from your profile if you would like, as most people will no longer see it, and 80-90% of the engagement will have already happened. This way you can also keep your profile clean for the future. Repeat every day from June 27th until July 1st. 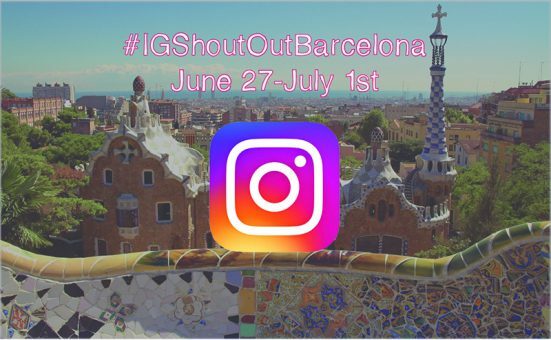 We encourage you to search the hashtag #IGShoutOutBarcelona when you are posting, and like and follow each of the profiles listed. This is a community building exercise. And of course, follow Homage to BCN on Instagram too at @H2BCN.